Edge data centers are increasingly becoming a more critical asset to companies. In many cases, these types of facilities augment cloud resources while in others they support applications that are returning to the user premises from the cloud. In still others, they support emerging Internet of Things (IoT) applications. No matter the reason, these edge data centers are cropping up all over to support critical applications. 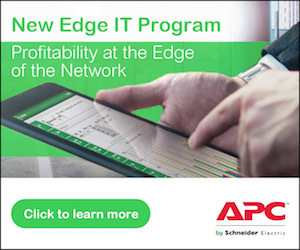 And therein lies an opportunity for APC by Schneider Electric partners, for a simple reason: wherever IT equipment is supporting critical applications, there’s a need for proper infrastructure to support and protect that equipment. First, let’s be clear on what we mean by edge data centers, because they come in many forms. A large enterprise, for example, may have a large, centralized data center but multiple regional – or edge – data centers spread around the country. Those regional facilities may be standalone buildings or occupy space in an office or other building. In some instances, they may be prefabricated, modular data centers housed in an ISO container. Owners of such data centers likely have a pretty good handle on requirements around UPS protection, proper racks, PDUs, and other supporting infrastructure. Another more common example is a rather small computer room that serves a modest group of employees in an office building, a school, medical facility or the like. Here’s where things can get interesting because these computer spaces are often an afterthought; they came in after the building space was already set up and functioning. Then suddenly plans changed. Maybe that cloud application that sounded so great 3 years ago didn’t work out so well, so it’s coming back in house. Or maybe response time isn’t what it needs to be for cloud apps, so the company is installing network optimization gear to remedy the situation along with additional servers to handle some tasks locally. Any of these are examples of edge data centers. No matter the shape or size, they have one thing in common: they are serving an important purpose for the organization. And given that, they need proper protection. This is where the opportunity lies for APC partners. Say you have a customer who comes to you for a UPS to protect some new piece of equipment. You could simply sell them the UPS, perhaps one of our new Smart-UPS with APC SmartConnect models, and be done with it. Or, you could use that request as an opportunity to launch a discussion about UPSs and the UPS LifeCycle. Delve into why the customer needs that UPS. What will it support? Have there been changes in the environment in terms of IT equipment? What kind of applications is the location supporting, and how important are they? What would the repercussions be in the event of an outage? Another vital conversation to start with customers in these types of spaces is on physical infrastructure monitoring and security at the edge. Because edge computing facilities are often in places that are not purpose-built for IT such as office rooms, outside, or in closets, security and environmental monitoring needs to be at the forefront of their minds as they are significantly more vulnerable to malicious activities and human error as well as environmental factors. By asking these sorts of questions you may well uncover the makings of an edge data center. Then you can start asking whether the customer has proper racks and/or enclosures, PDUs, and even physical security, management tools and services. Educate the customer on how to treat this IT gear with the importance it warrants given the function it serves on behalf of the company. On top of positioning yourself as a trusted advisor to customers, and selling more APC products, selling into edge computing environments makes you eligible for discounts in a variety of spaces. With our Edge IT Offer, you can get up to 17% off when you sell and design edge solutions depending on the exact products involved in the deal. And there’s no maximum to the amount you can save. There are no revenue requirements to be eligible for these discounts. Deals to K-12 customers are eligible for discounts of up to 12% on product categories including UPSs, cabinets and enclosures, rackmount PDUs and extended warranties. Customers in the K-12 space, as well as public libraries, are also eligible for reimbursements under the federal government E-rate program. For schools, the government matches IT invoices dollar for dollar ranging from 20% – 90% based on the affluence of the school district. Those kinds of discounts make it far easier for you to sell a customer on the infrastructure they truly need. There’s no time like the present to start some conversations with customers about how important it is to protect the IT and network gear that supports critical applications they rely on day in and day out. It’ll help you sell more APC products and services and be eligible for some big discounts. There’s a lot to like about the edge. Take a look at our robust catalog of infrastructure and management solutions that will ensure your customers’ edge computing environments are secure and protected.